The PSL Rheotek RPV-1 (2) two position Pulp and Cellulose viscometer system is suitable for measuring a wide range of pulp and cellulose products including bleached wood (paper pulp), bleached chemical pulp, digester samples, cotton linters, regenerated cellulose, aged electrical papers and pharmaceutical bulking materials. The RPV-1 Pulp Viscometer is designed to be integrated with the iSP-2 Sample Preparation system for pulp & cellulose. 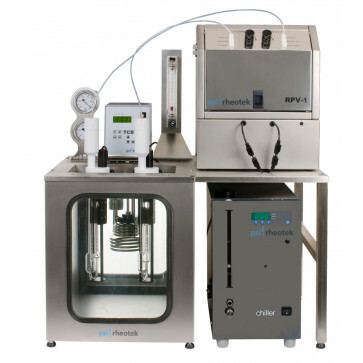 PSL Rheotek Polymer Viscometer – two positions complete with viscometer bath, chiller, control module, nitrogen purge system, two measuring heads, two filling stations, PC control system and PIAB vacuum system.